Visual discovery of network patterns of interaction between attributes in a data set identifies emergent networks between myriads of individual data items and utilises special algorithms that aid visualisation of ‘emergent’ patterns and trends in the linkage. It complements conventional data mining methods, which assume the independence between the attributes and the independence between the values of these attributes. The approach complements analytical data mining techniques where the rules or definitions of what might constitute an exception are able to be known and specified ahead of time. For example, in the analysis of transaction data there are no known suspicious transactions. 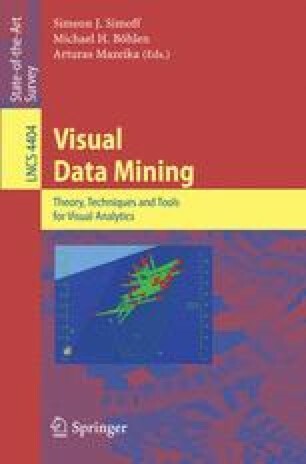 This chapter presents a human-centred visual data mining methodology that addresses the issues of depicting implicit relationships between data attributes and/or specific values of these attributes. Different aspects of the approach is demonstrated through the reflection of the analytical process in two cases: one looking at fraudulent activity which will be difficult, if not impossible to detect with conventional exception detection methods, and the other one looking at exploring a large data set of low level communication data. The chapter argues that for many problems, a ‘discovery’ phase in the investigative process based on visualisation and human cognition is a logical precedent to, and complement of, more automated ‘exception detection’ phases.